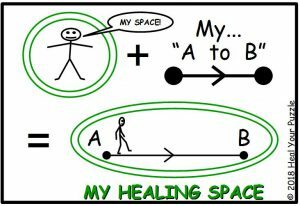 It occurred to me recently that I have never really explained what actually is my understanding about Your Healing Space… What is an Energy Space? …and What takes place in it to support your Healing and Self-Development Process? A Healing Space to me is an Energy Form and I became familiar with it through my own learning experiences. This first started, although I did not understand it at the time, when learning how to meditate and then when I later trained in Energy Work. Protected Safe Energy Space When you prepare to meditate, you need to be in a safe, quiet physical place where you will not be disturbed and then go through a process of relaxing your body and mind. My Holistic Training increased my awareness of this process and my ability to further the effectiveness of the Space, making it intelligent and responsive. With practise this took my meditation to a much deeper level of consciousness because when you feel safe and protected, the mind can process more information more efficiently. During meditation I began to observe my thoughts completely unaware of my body or my surroundings; I began to see vibrant pictures and sometimes storylines unfolded in front of my eyes; I began trying to draw what I had seen and was amazed how hard I found this to do. My Healing Journey – My “A to B”… Because of my further training in Kinesiology, I started to use energy techniques to understand and facilitate my drawing process which grew into a practise of not only drawing my Personal Goals (my “B, C, D” etc) but included my Now (my “A”) and the path between. After a while I began to find that my pictures had blank areas and felt incomplete which led me to realise that our Goals also have a backdrop of sub-conscious and deeper conscious information. This was yet another one of those lightbulb moments when a door opened in my understanding about what hampers us in achieving our personal potentials.